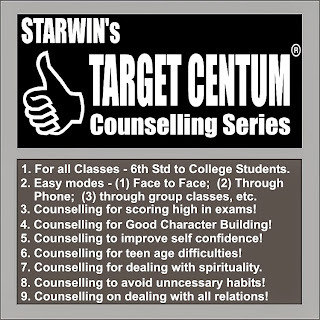 OUR COUNSELLING SESSIONS SPECIALLY FOR YOU! Everyone is perfect while taking birth. But, in the course of life, they adopt some qualities. Unless it is evaluated in time, it may set in their life permanently. There are many students/ people who are struggling with various problems and struggles in life. Many students seem to read, but, they do not score high. Many others study well till a certain age and then score less later. Many others score high, but, not upto centum. Many others are confused by the attractions of this modern world. 1. For scoring high in exams! 2. For Good Character Building! 3. To improve self confidence! 4. For teen age related difficulties! 5. To follow spirituality for a meaningful life. 6. To avoid unncessary habits! 7. For dealing with relations within family/ group! How to get counselling sessions customised for you? 1. 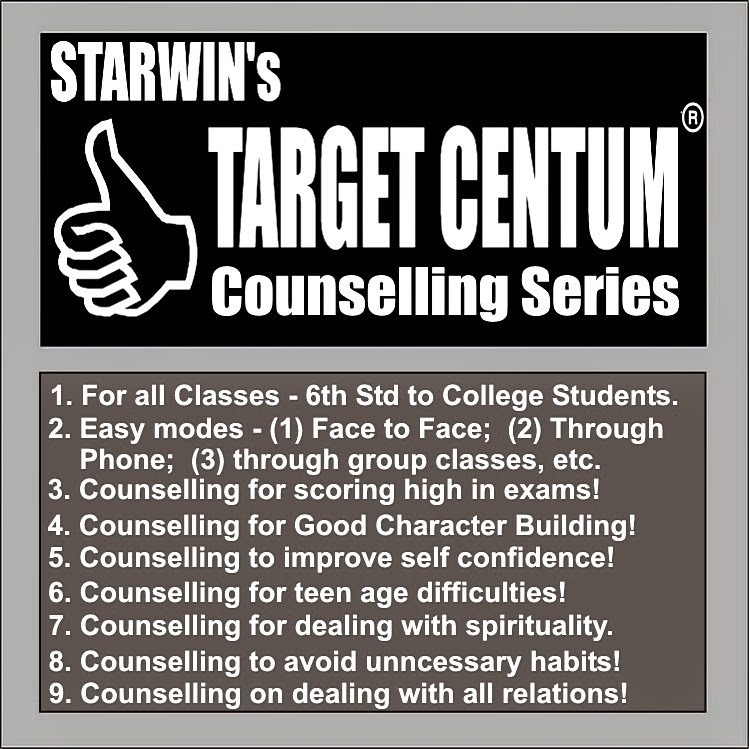 Face to face counselling exclusively for a single student. 2. Group Counselling for a small group of persons. 3. Distance Counselling - through phone. Contact 96 88 33 22 33 (or) 93451 55444, (or) mail to: director@starwin.in. We will send you a questionaire to be filled and sent back to us. Based on the replies you give, we will customize the counselling session for you and give a date for you.